Ideal for students, hobbyists, muralists, decorative painters, and fine artists who work on a grand scale, Winsor & Newton Galeria Acrylics deliver professional results at an affordable price. These versatile colors offer excellent brilliance, clean mixes, strong brushstroke retention, and straight-from-the-tube workability — plus the quality for which Winsor & Newton has been renowned for nearly 200 years. High-performance Galeria Acrylics have a smooth, free-flowing consistency that makes them easy to use and mix, especially for beginners. Their working properties can easily be modified with Galeria Mediums. When diluted they are suitable for a wide variety of techniques including stenciling, collage, sponging, airbrushing, and more. Galeria Acrylic Colors offer excellent adhesion on a wide variety of properly prepared surfaces, including paper, canvas, leather, fabric, hardboard, wood, brick, and plaster. Colors are water- and weather-resistant once dry, making these paints an excellent choice for murals and outdoor sculptures. Although Galeria Acrylics are sometimes referred to as "student grade," their high pigment levels deliver professional results with significantly better covering power than many similarly priced brands. 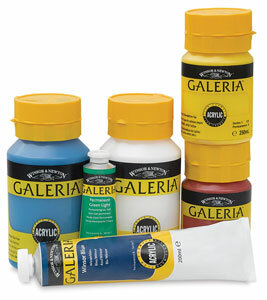 Mixing Colors — The Galeria Acrylics spectrum includes six important mixing colors. From these six colors, many varied, vibrant, and "clean" colors can be mixed. This is because each color has its own bias. Mixing two colors with suitable bias will provide "clean" colors rather than muddy ones. For example, mix Permanent Rose and Ultramarine for a clean Violet.